I once fronted a meeting on an estate shortly after having written a letter to all 350 households saying we were considering knocking their flats down. The estate manager was very impressed with the turnout. ‘What did you say to them Claire? The last time I got this many residents out to an open meeting was when I suspended two parking bays.’ In an unrelated workshop I ran with colleagues, I broke the ice by asking 50 or so dedicated housing managers to muse in groups for a couple of minutes on what it was about their own home which was most important to them. Bringing the animated table discussions to a hush, I looked forward to the first feedback. ‘What’s most important to me is that I can see my car from my living room.’ That told me: dreams of space, light and warmth were subservient to the vehicular view. These staggering anecdotes remind me just how emotive – bordering on frenzied – the issue of car parking is both to city and suburban dwellers. As one of life’s rare non-drivers, I am simply not troubled by the problem of where to park and whether my car will be there when I return. 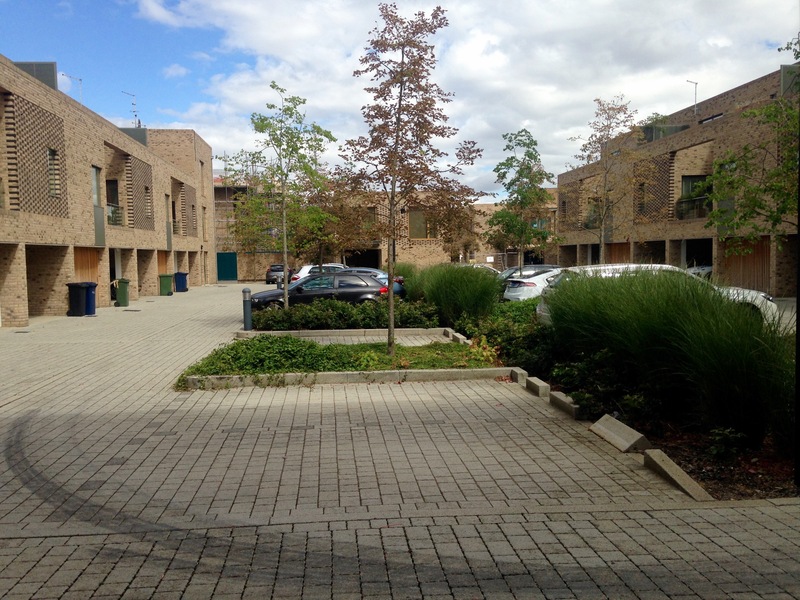 But directing the design of suburban housing projects means putting parking high – very high – on the agenda. As most people who live outside London’s ever more bizarre bubble already know, two cars per home is pretty standard for new build suburban housing developments. There’s actually no point wishing them away with misguided middle class breast-beating either, because providing fewer parking spaces does not actually deter the determined. Guerrilla parking dogs even the best new developments, as this thorough study soon uncovered: nobody tells the Brits where and how to park. Estate agents will gleefully tell you that properties are unsaleable without their double car slots and they are probably right: so what can be done? My visit to Cambridge’s flagship new south-western settlements showed just how hard it is to incorporate this frankly absurd volume of cars into an overall spatial programme. 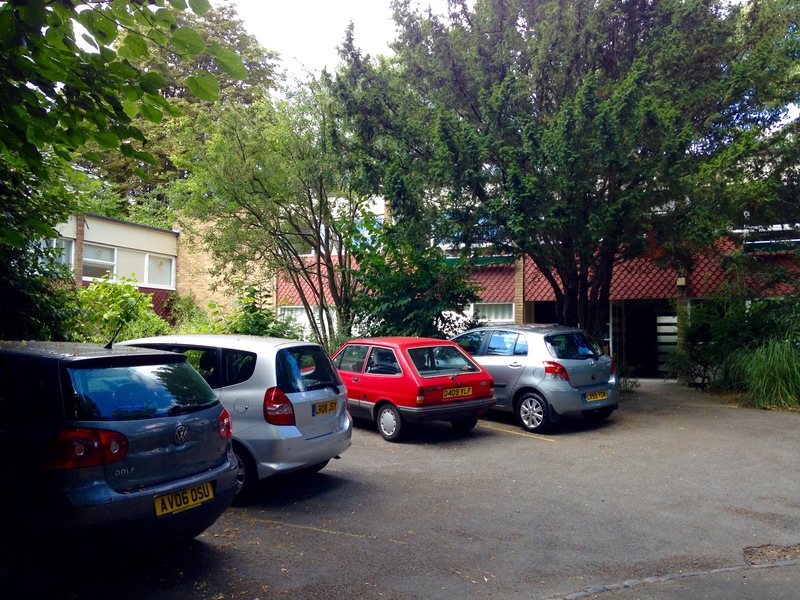 All the parking formats are represented here: on-street, car courts, integral and side garages, front garden parking and various ugly hybrids which result in protruding car bottoms dominating the street scene. Wonderfully narrow lanes only result in street elevations being a string of dumb garage doors. 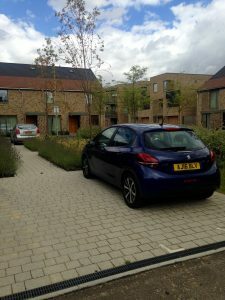 Terraced housing – our English vernacular – is all but impossible in two-to-one world, without space-hungry and dangerous ‘nose-in’ parking outside. Cars can be confined to backland courts, but these are soulless places for bad behaviour and rubbish dumping. 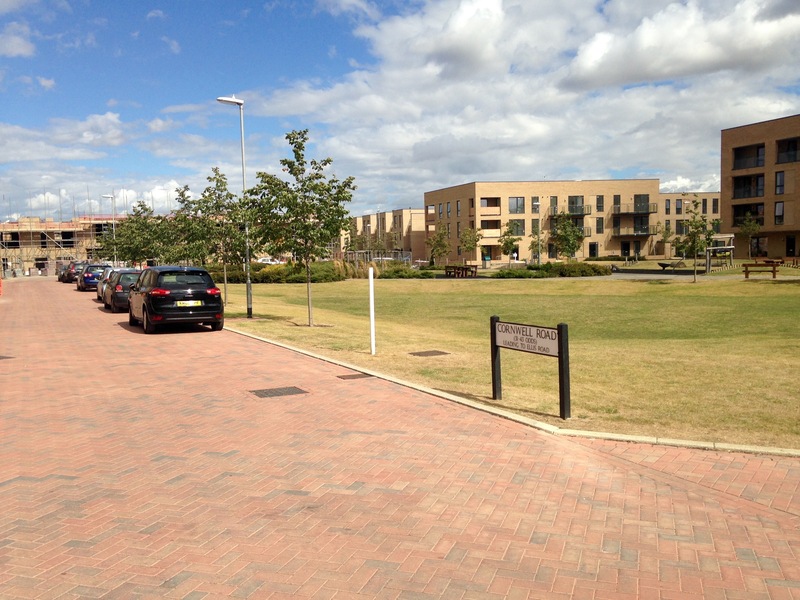 Schemes where there are fewer, but unallocated spaces should allow everyone to park: I think they’re called ‘streets’. Not only do local authorities discourage this mode, but also people cannot abide the uncertainty and will park absolutely anywhere as long as it is close to their home. (Private parking enforcement appears to be a weak sanction, even though £100 is the most common charge). 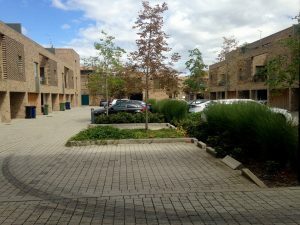 Of course, parking is only part of the ground plane; and how it is arranged materially affects the potential for playable and community-forming shared spaces. 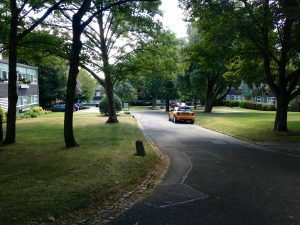 Ranks of street-based parking can form an off-putting barrier to a local park; court-based parking with its wasteful access strip is a criminal and often desolate mis-use of precious space. 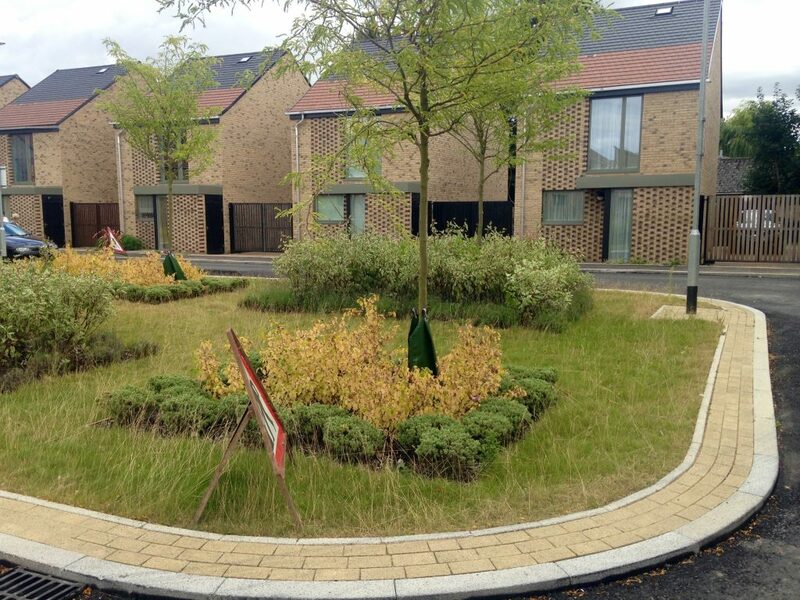 One man’s privately seconded tessellating block paving is another woman’s lost allotment. I calculate that I will lose one hectare – that is a square of 100 by 100 metres – in parking and access for my current 6 hectare development. And cars are stationary 95% of the time. 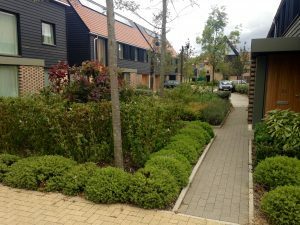 So if you want to design housing at densities of 40-50 homes per hectare, a responsible and land-efficient density, you are faced with difficult choices. I do not want to commission a car park with some housing crouching apologetically somewhere within it. I want to commission a beautiful place which incorporates play, greenery, serenity and the ability to rush out of a front door without a care. Park or parking? Vote with your feet! 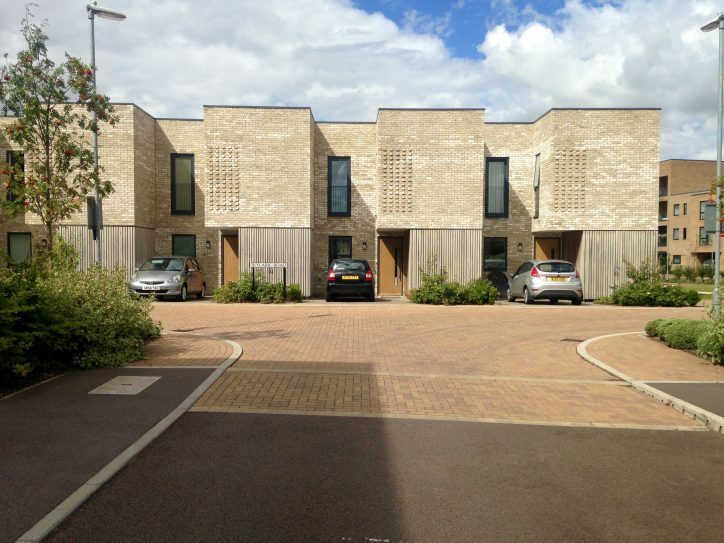 PS1 The housing pockets at Trumpington are very variable in quality. It was a joy to discover the crooked lanes of Royal Way with their secret play pieces and lush planting, reminding me very much of Viken. The close-packed houses by Proctor and Matthews use two carefully chosen materials with craft and love. Later phases, as is so often the case, have been pared back to the point of soullessness and the architects of those areas have not been allowed to care for the detail. I am sure the early phases cost too much, but the late ones cost too little. If only people didn’t buy it. PS2 In 1950, there were two million cars. In 2011, there were 28.5 million. That is why post-war Span Estates, of which more another time, tease us with their beguiling and yet now unattainable aesthetic. PS3 The Europeans just don’t do this: they almost always sink their cars, no matter what the cost, and are left with a playable and green haven above ground. We could prioritise more and better public transport and cycle routes in our UK suburbs, obviating the need for these contortions of spatial form, but that would require a fundamental cultural shift: we do not share well here in England.